Inside of our #UTSFam, we have a group of AMAZING humans who love supporting each other and this community we live in, as we all try to improve ourselves daily. ^As the owner of UTS, I have obsessed over and chased this very mission since we opened in 2011, daily standing by our values that make us more than just a gym. I wanted to find a way to help all the incredible humans around us that make up this short but special opportunity we call life to through more than just weights, physical challenges, and numbers on a scale. For me, and now for us as a member family, that means serving our community in any way we can, whether that be through bringing awareness to a problem, raising money for a cause, or simply bringing people together to engage in conversation about movements and topics that help influence our community in a positive manner. Check out Our Next Charity Event ! “Seeing up close what day to day life is like for someone with cystic fibrosis has changed my perspective on a disease that desperately needs a cure. from what seems like non stop treatments and medications, to constant worry of how the weather or other people’s germs will affect her lung function on that particular day…to seeing the amount of effort that must go into the amount of physical work i take for granted. 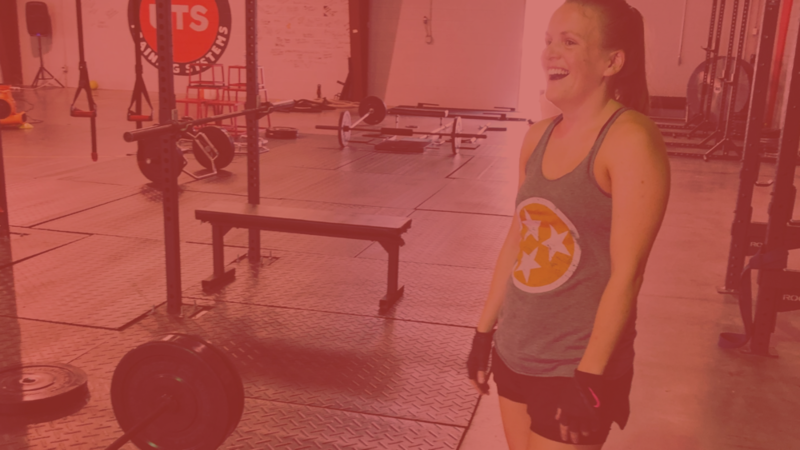 what kayla pushes through is nothing short of amazing.” -Blake Denny, owner of UTS. Partnering with the local Knoxville Chapter of the Cystic Fibrosis foundation is near and dear to our hearts here for obvious reasons. They represent one our FOUR charities that we support every single year, and with our Third Annual “Lift for Lungs” workout, we hope to continue the tradition with more money raised than ever. Kayla’s story, while truly inspiring, is also one of many throughout the world that suffer from a disease that is still without a cure, and represents one of the more expensive and highly attentive daily routines necessary to stay in good health. From breathing treatments to a large amount of medications, it requires its own schedule in and of itself, in addition to the every day duties of being a working individual. Luckily, the Cystic Fibrosis Foundation is an incredible organization that funnels a large majority of money raised directly back into research, in hopes of continuing to improve treatment, and one day find a cure. Every dollar helps along with simply raising awareness and standing (or working out) in support of an awesome human, among many, that needs our help. Just click the link below to come to the Lift for Lungs event, or simply donate to the cause. Yes! I would love to donate! Learned more about themselves both in finding their own limits, or understanding and appreciating their abilities. ^The cool thing about our Charity events is the entire premise is based on number three: we are trying to give powerful moments to people, causes, and charities through our support and understanding of what they go through on a daily basis. An intro to the other awesome humans showing up in support, from a few icebreakers questions to get us all flowing, followed by a quick drill we use to drive some team work and get to know your fellow exercisers. A quick discussion and demonstration regarding the charity we are supporting, from introductions to special guests, to a quick rundown of what the charity is all about. We then warmup as a crew, utilizing many of the very movements we use with our #UTSFam daily. Helping you get your joints feeling great, exploring some ranges of motion, and ultimately preparing you for the work to come. After a little increase in heart rate and blood flow, its time to divide up into groups and hit the workout for the day. From exercise scavenger hunts, to team challenges, to sometimes getting a taste of our Solidarity Saturday workouts we use in our programs, you will see and experience a variety of workouts with expert attention from our coaches and some fellow #UTSFam. Finish up, high five, and hang around. Each event has its own flavor, with food, music, or shenanigans involved, we encourage you to hang around and meet other people supporting an awesome cause. You never know, you may just find a new friend! Each year, we participate in the “Real Men Wear Pink” campaign to help raise money for the American Cancer society. In 2018, we raised almost $2000. Our owner, Blake Denny participates yearly in the cause, from hosting workouts and info sessions, to leading warmups on Cancer Walk day, it has become a staple in our yearly support for the community. Its easy to feel attached to a charity, when you get the privilege to help those that have are unfortunately affected by designing exercise programs to help overcome the struggles in lung function associated with the disease. From the 2016 Rising Stars campaign participation by owner Blake Denny, to yearly support of the Kayla’s Krusaders walk for Cystic Fibrosis, the local chapter of the CF Foundation is one of the four main charities supported by Unlimited Training Systems. Every year, we look to find charities that align with our own vision and principles as a business. Almost every charity event we host is near and dear to the heart of at least one #UTSFam, and many times they contribute in organization of and hosting. Let us know if you have any suggestions or willingness to help or contribute in the future. In the meantime, click below to come to our next event! Yes! I want to attend the next Charity Event!